Control your new Proto Home from an iPhone, iPad or computer. We were intrigued by the idea when a Los Angeles builder contacted us to help with the launch of their new company, Proto Homes. With a patent pending and international interest, they had essentially shifted the building paradigm with a more efficient process that enables cost-effective modern design. New concepts include the “Proto Core” – a prefabricated centralized infrastructure that houses all utilities, in addition to serving as structural support. “Hyperspace Core” allows an open and flexible plan, rather than restrictive rooms. This enables homes to be easily reconfigured for changing family needs. 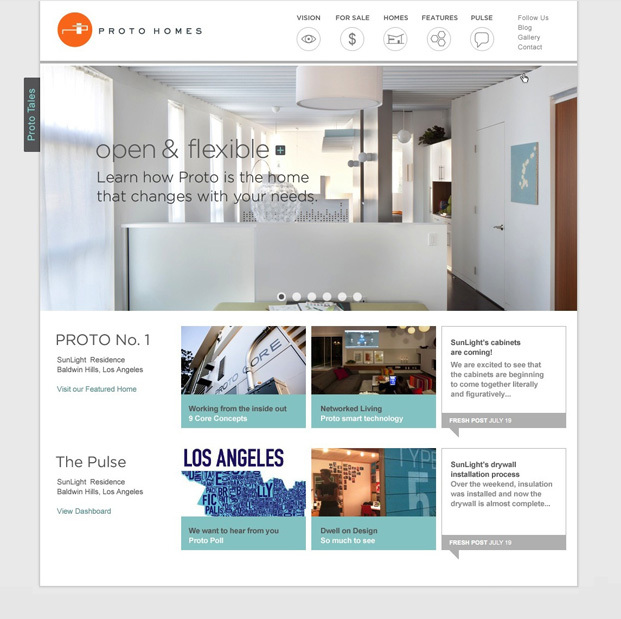 Our branding project included design of the Proto Homes corporate identity and a content-rich website. The theme of “Home as Product” is apparent throughout the website, as our approach was more akin to a retail offering than a traditional home sales website. 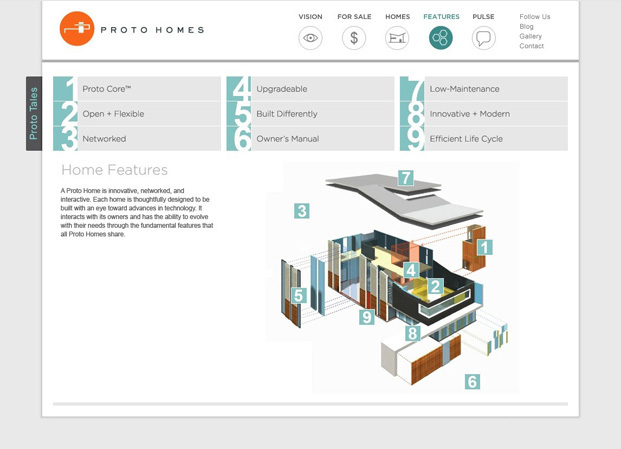 The products were separated into two sections: “Proto-to-Go” featuring already constructed homes and “Proto-on-Demand” offering custom home design services. The website also includes unique features like a user poll, allowing viewers to vote on the location of the next Proto Home.